A couple of days ago, a few of our readers shared their experience of receiving fake virus alert popup while browsing the Internet on their mobile device. This Article tells you more about these fake virus alert popup. As we all know that unwanted and malicious pop-up mobile ads have been around in the Internet for a long time now. Hackers compromise vulnerable websites and force them to display false virus threat notification to trick users into downloading a fake or free virus protection software, which in most cases, is a malware in itself. We also, released a blog post talking about this issue some time back in 2014. The post helped users identity fake virus alerts and mobile antivirus apps on the Internet. Hackers are now increasingly using the same tactic to trick mobile phone users. As mobile devices are becoming the primary medium to access the Internet, hackers are using this trend to their advantage. As you can see, this fake virus alert popup message looks critical enough to trick anyone who is reading it, especially if the user is unaware of such scams. In most cases, clicking OK takes the user to a third party site where they are asked to download an free antivirus download app which claims to clean the infection. Please be advised that mobile browser Fake Virus Alert Popup notifications such as these are fake virus alerts and you must never respond to them. In almost all cases, these so-called fake and free antivirus apps turn out to be adware that serve unwanted ads to trick users and earn money for scammers. In other cases, these apps could be a Trojan horse, or a spyware that steals personal information. In all cases, such apps are unsafe. Do not visit websites by clicking on links received in unwanted or unexpected emails. 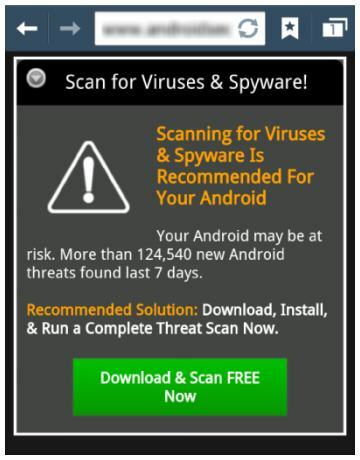 Run an mobile antivirus scan on your mobile using a trusted mobile security app. Install a reliable popular mobile security app like Mobile Security is now Free for Android smartphone. The 5 Biggest Antivirus Software Blunders. If you come across any fake virus alert popup message such as the one shown in this post, do let us know about it via the comment section below. Stay safe! Unidentified luxurious modern homes interior designs and decor ideas! Is it possible to lookup or track Bitcoin transaction?